Situated in tirana and with national theatre of opera and ballet reachable within 1.7 km, all stars hostel in tiranë features a garden, non-smoking rooms, free wifi and a shared lounge. boasting a terrace, thi... Lexo detajet..
Hotel kthella resort is offering accommodation in rrëshen. with free wifi, this 4-star hotel has a terrace and a shared lounge. guests can dine in the on-site restaurant or relax in the bar. at the hotel, ... Lexo detajet.. Situated 100 m from skenderberg square, boston hotel in tirana features rooms with air conditioning and free wifi. located around 5 km from dajti express, the hotel is also 1.6 km away from sky tower. national ... Lexo detajet..
Guesthouse pension andrea is located 250 m from the centre of tiranë. it offers accommodation with free wi-fi. the main bus station is 200 m away. all accommodation units feature a bathroom with a shower. ... Lexo detajet..
Set 1.9 km from skanderbeg square, hotel villa 22 features accommodation with free wifi in tirana. 7 km from dajti express, the property is also 2.2 km away from sky tower. the hotel features a restaurant, and ... Lexo detajet.. Lot boutique hotel offers accommodation in tirana. guests can enjoy the on-site bar. free wifi is featured throughout the property and free private parking is available on site. every room at this hotel is ... Lexo detajet.. The luxurious monarc hotel is ideally located close the centre of tirana, only 450 m from the skenderbeg square. the property features modernly furnished rooms and free wi-fi. a restaurant and bar are available... Lexo detajet..
Offering a restaurant and a bar, hilton garden inn tirana is located 1.6 km from skenderberg square. the national arts gallery and sky tower are reachable within 1.7 km and 1.4 km. free wifi is provided. al... Lexo detajet.. Located near the selman stermasi stadium in tirana, broadway hotel offers free wi-fi access. tirana park on the artificial lake is 1 km away and features a zoo and a botanical garden. all rooms come with ca... Lexo detajet..
Hotel parlamenti is located in the historic centre of tirana, next to the albanian parliament. the skenderbeg square and the main promenade can be reached in 5 minutes. the hotel features a bar and dining area ... Lexo detajet..
Boasting a seasonal outdoor swimming pool and garden, mai tai resort is located in tirana, 7 km from skanderbeg square. built in 2008, the property is within 11 km of dajti express. every room includes a balcon... Lexo detajet..
Offering free wifi, prime hotel offers accommodation in tirana, 80 m from skanderbeg square. popular points of interest nearby include national arts gallery and national theatre of opera and ballet. every room ... Lexo detajet..
1.7 km from skanderbeg square, vila ada hotel is situated in tirana and features a garden and free wifi. with a terrace, the property also has a shared lounge. guests can enjoy a meal at the on-site restaurant ... Lexo detajet..
Offering free wi-fi and free parking, sky 2 hotel is set in the heart of tirana just 200 m from the main square. it features air-conditioned accommodation and a restaurant serving authentic regional and interna... Lexo detajet.. Featuring free bikes, hotel colosseo is located in vlorë, 2 km from kuzum baba. this 3-star hotel offers a 24-hour front desk and luggage storage space. each room is equipped with a balcony. at the hotel, ... Lexo detajet.. Located in pogradec, rent room kapri features accommodation with free wifi. fitted with a balcony, the units feature a tv and a private bathroom with shower. guests can also relax in the garden. ohr... Lexo detajet..
Set in tirana, 2.9 km from skanderbeg square, and national theatre of opera and ballet reachable within 2 km, villa 27 residence offers free bikes, a garden and free wifi. certain units come with air condit... Lexo detajet..
Centrally located in tirana, freddy's hotel offers air-conditioned rooms with free wifi and satellite tv. various shopping streets and bars can be found within walking distance from the property. a collecti... Lexo detajet..
Set in the very centre of tirana, just a short walk from skenderberg square, sar'otel offers an on-site bar, a common terrace free wi-fi and secured parking. guests can use the swimming pool for free, while the... Lexo detajet.. Featuring an on-site restaurant serving traditional albanian and italian cuisine, hotel boutique villa fernando offers spacious and comfortable rooms with vintage furnishings. skenderberg square is 1.5 km away.... Lexo detajet.. Within only 200 m from the central skanderbeg square in tirana, the elegant arber hotel offers free wi-fi, free parking and a restaurant in close proximity to tirana's most important sights. its air-conditioned... Lexo detajet.. 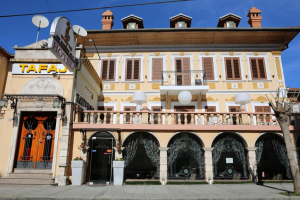 Featuring an on-site restaurant, hotel colosseo tirana offers air conditioned accommodation in tirana, 1 km from skenderberg square. free wifi is available. 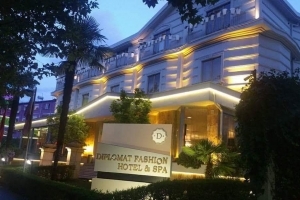 each room is fitted with a flat-screen satellite ... Lexo detajet..
Offering a spa centre, sauna and hot tub, hotel plaza tirana is situated in tirana in the tirana county region, 200 m from skenderberg square. the guests can enjoy a drink at the bar or have a meal at the resta... Lexo detajet.. Located in the centre of tirana, padam boutique hotel features uniquely furnished rooms decorated in victorian and vintage style with a dash of modern luxury. the villa offers high ceilings and is surrounded by... Lexo detajet..
Set 850 meters from skanderbeg square, hotel stela center in tirana has a garden and shared lounge. this 4-star hotel has air-conditioned rooms with a private bathroom. the accommodation provides a 24-hour fron... Lexo detajet..
Albanian hotels me sherbime cilesore si dhe hotele me ambjente relaksuese. ketu do te gjeni hotele ne tirane te lira si dhe albanian hotels, explore albania holidays and discover the best time and places to visit. .